Honey bee traps are dead easy to make. 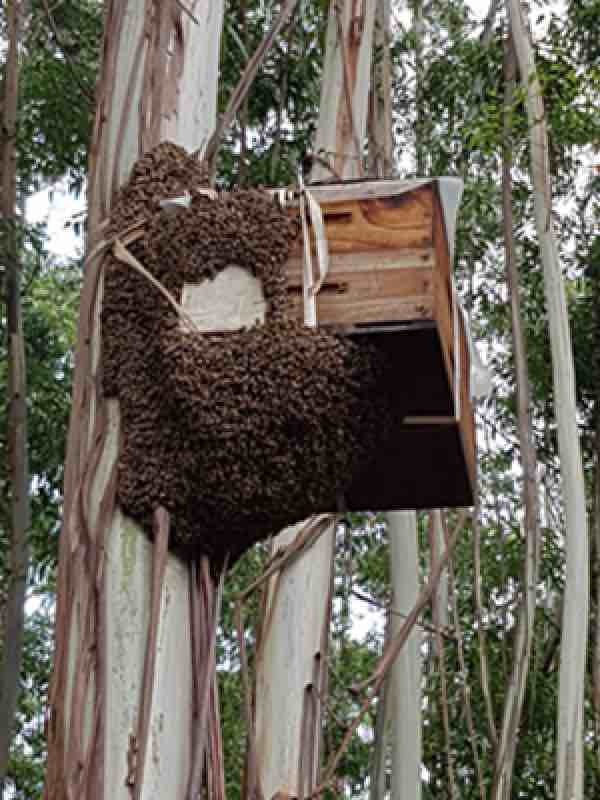 Raising bees the easy way, in South Africa at any rate, is done by placing an old hive up on a suitable roof, or tree stump, during the swarming season. Provided the bee trap has been prepared in the correct way, you'll catch bees without fail. I've already caught two swarms this season. This natural beekeeping method is much easier than splitting strong colonies, albeit that has its merits too. Our bee, apis mellifera, is an inveterate swarmer. As soon as your hive starts to fill with honey, they start to breed new queens and, whoops, half your workers have vanished over the horizon with all the honey they've stored; more later on splitting hives. I say up high, perhaps a metre or two above the ground; that's the conventional wisdom of bee lore. However, nothing beats a pile of old beehives and that doesn't need to be raised up high. Just make sure that your old empty beehives have frames in, with strips of wax, otherwise they will build comb in any and all directions. 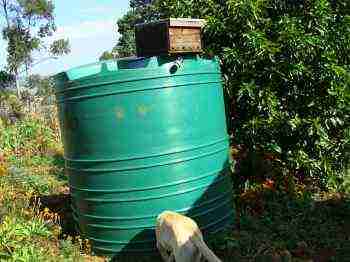 How high should you place your honey bee traps? It's a bit of a compromise. In theory it should be about 3 to 5 metres above the ground, but then it's difficult getting a heavy bee trap down from a high roof or up in a tree. I find 2 to 3 metres above ground is fine. You might need a ladder, then it gets more tricky. Dropping a hive full of bees can be fun. Where should you place the bee trap? Not on your own roof. It should be at least two kilometres away from your apiary, preferably more, and in an area where they is plentiful pollen and nectar; what you want is full wild hives that are preparing to produce swarming bees because the capacity of their hole in a tree or the ground is limited. If you move the bee trap a short distance, the bees will simply return the next day to where your trap was, and you'll lose half the work force. How long should you wait before bringing the hive with a new colony to your home apiary? Beginners often make a mistake here. You see, initially the scouts come and check the bee trap out. Often they start cleaning it out, and getting all in readiness for the day the boss brings her swarming bees. Beginners tend to think the swarm has already moved in, and take the box home, only to have a big disappointment the next day. And unless you get the box back quickly, you'll lose the colony that is just preparing to make a home in your bee trap. How do you attract swarming bees? Only use a hive that has been previously occupied by bees. If you have only a new hive, then place it on top of an existing colony for a week for the smell of bees to permeate the hive thoroughly. 2 or more frames that have been worked by bees. Old combs are perfect, but new combs that have spent a week on an existing beehive are fine. The bees must have started drawing out the foundation, but not so long that they have begun to store honey, or eggs laid. The queen loves new foundation for laying eggs, and she will readily go up to the combs in your trap hive if you leave it there too long. Four outer frames, two on each side, with full foundation. If they are drawn out, as above, so much the better. Then you'll need four inner frames in the centre with only a strip of foundation wax perhaps two centimetres wide, also preferably drawn out as above. We've found that swarming bees will choose a bee trap with this space created by using strips in the centre over a trap with full foundation throughout the hive. It's a place where the new and often quite small colony can cluster. 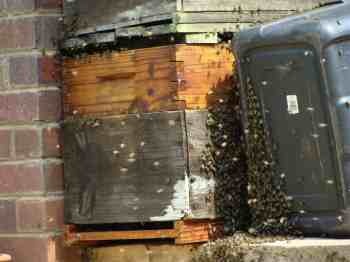 Ideally, within a week of the bees moving in, you should replace these strip frames with full foundation. Why? Because the workers will build drone cells, and you don't want that. You want a hive full of workers, not drones. In short, prepare a bee trap with a couple old combs and eight foundation wax frames; place it on an existing hive for a week, or less if you are in a strong honey flow, until the bees have started working the foundation wax. Now remove the bee trap, and place it on your tree stump, tank, roof; it won't be long before the swarming bees arrive. I've caught hundreds of feral swarms in this way; actually probably thousands over fifty years of backyard beekeeping. It works, but only if it's during a honey flow. It's a complete waste of time during a dearth of honey and pollen. The feral colonies won't be swarming. Don't delay in moving your honey bee traps to their permanent location; that means within three weeks of them moving in; that's when the new brood will start hatching. These bees in this honey bee trap have far exceeded their living quarters and, in that clump under the hive, they've actually started building comb in which the queen has begun to lay eggs. As a rule of thumb move your catch boxes within three weeks of the new colony taking up residence; they are much less fierce before the young brood starts hatching. All serious beekeepers get involved in requeening your honey bee traps; it's the old queen who is driven out of the hive and arrives in your catch box. Requeening reduces the strong swarming instinct of some species like our Scutellata, and obviously if she lays an abundance of eggs, the more workers there will be; and greater honey production. I did it for several years, but there were several difficulties. It broke my heart to squash the existing aging queen. With Italians it may be relatively simply, but with our aggressive colonies, she is difficult to find and there's the likelihood of getting the whole neighbourhood stung. I eventually decided it makes more sense to split a boiling colony that's about to swarm, introducing a queen cell to the queenless half; or placing a frame of very young brood and eggs. Day 5 or 6: she sets off on her mating flight, and you hope a drongo doesn't get her. Day 19: Eggs should be present. Day 23: Larvae should be present. And then unite the two colonies and you'll have a very strong colony with a young queen; bee lore has it that the young virgin will destroy the old monarch; I suspect it's not always the case. Here are a few thoughts on the pollen in honey. Men should assume they will get problems with their prostate glands, because it's very common, and extremely unpleasant. You can either buy pollen for prostates, or start considering honey bee traps. Part of the solution is pollen for prostates; that means lightly filtered honey that doesn't remove the granules from your honey. But don't forget the tomatoes(1) and avocados(2). The food industry is frankly totally unscrupulous; they'll extract the vitamin E from healthy flour, and then sell it to you at ten times the price in soft gels. Likewise, they'll filter out all the pollen from your raw honey and offer it to you for your prostate in capsules. How to start beekeeping is not just for fruitcakes; it's been the one enduring hobby of my whole life. You could put honey bee traps up too and start enjoying pollen for your prostate. You too could have a PSA of 0.9; not bad at 70! There's another small advantage to having pollen in your honey. Why does honey crystallise is a vexed question for some; that honey can set with ugly, irregular crystals. The pollen acts as a seed for the crystallization process, giving a more uniform set. It takes time and energy to grind your own healthy flour for your baking, and to produce your own raw honey; but it's fun, lucrative and starts with honey bee traps. How many hobbies are there that more than pay their way? 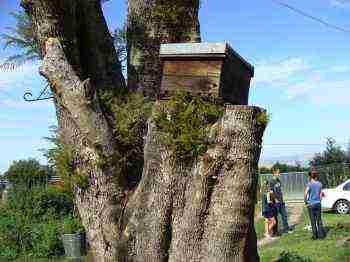 Honey bee traps should be made from a previously occupied hive; swarms like the smell of an old box. Alternatively daub them, in and out, with crushed old combs that have been boiled up.